The New Hope Winery has been an established winery in Bucks County for over 25 years. We are now onto a new venture of adding a full bar and restaurant to our establishment but we are still proud to sell our PA wines. We also have the unique opportunity to import fine wines from all over the world to cater to any wine palette. 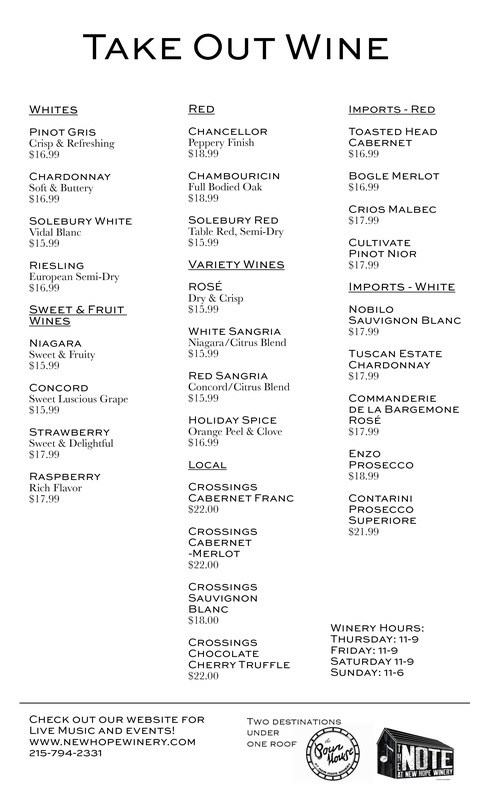 A list of take out wines can be viewed and downloaded to the right, and below a list of our wines by the glass and bottle if you would like to join us at the winery and Pour House for an lunch, dinner, or a drink on our patio. We are now offering a wine flight in lieu of a classic tasting, this includes three-two ounce pours of your choice of our New Hope Winery wines. *NHW designates a New Hope Winery Wine.